State Representative Vincent Candelora proudly represents the 86th General Assembly District, which includes Durham, Guilford, North Branford and Wallingford. He was elected to his seventh two-year term in November of 2018. In his seven terms of service, Candelora has advocated for efficiencies in government. As a member of the legislature’s committee on Legislative Management, Candelora has held the position of Deputy Republican Leader since 2011. Candelora serves on the legislature’s committees on Finance, Revenue and Bonding, Public Health, General Law, Education and Regulations Review. He also serves as the Chair of the Screening Committee that is tasked with reviewing all legislation before it is put up for a vote in the House of Representatives. Candelora is an active member in the community where he serves on the Executive Board of the North Branford Little League, is a Boy Scout adult leader, and a Parish Trustee at Saint Ambrose Parish. In the past, he served as President of North Branford’s Chamber of Commerce and is Past-President of the North Branford Rotary Club as well. Candelora spearheaded the Rotary’s Centennial Project Committee, which constructed bathrooms and a concession stand at the North Branford High School. Prior to the Council, he served as Vice Chair of the North Branford Zoning Board of Appeals and Treasurer to the Republican Town Committee. He is an active member with St. Augustine Church where he has served two terms on the Parish Counsel, one year as President, and is also a Parish Trustee at Saint Ambrose Parish. Candelora has served on the North Branford Town Council for three terms, and one term as Deputy Mayor. He currently serves on the Board of Education Strategic Planning Committee, which is responsible for reviewing and setting the goals and standards for the North Branford School System. Candelora works at Taconic Wire, a stitching wire manufacturing business and operates the Connecticut Sportsplex, both family owned businesses. Prior to this, he practiced municipal and transactional law with Susman, Duffy, & Segaloff, PC in New Haven and served as law clerk to the Honorable Antoinette L. Dupont, former Chief Judge of the Appellate Court of Connecticut. 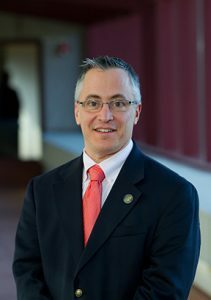 Vincent graduated from Connecticut College in 1992, and the Dickinson School of Law at Penn State in 1995, where he was Editor-in-Chief of the Dickinson Law Review and selected for the Appellate Moot Court Board. Candelora resides in North Branford with his wife, Carolyn, and three children, Christopher, Thomas, and Ava.